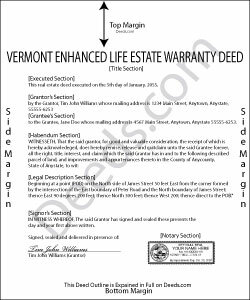 Owners of real property located in Vermont have access to a useful estate planning document: the Enhanced Life Estate Deed. In most cases, traditional warranty or quitclaim deeds convey a present interest in property, meaning that as soon as the grantor (seller) signs the deed, the grantee (buyer) owns the land. One way to forestall the transfer is to use a life estate, which allows the owner to keep possession until death. The grantee becomes what's known as a remainderman, or someone who holds a remainder interest in the property during the owner's life. To protect that interest, the grantee must agree to changes in the property's use. Note that transfers initiated under traditional deeds and life estates are permanent. Enhanced life estate deeds, also known as Ladybird or Granai deeds, convey a revocable future interest in real estate, with the transfer of the remaining title rights to take place when the grantor (owner) dies. These deeds reserve all present ownership rights for the owners, including the right to sell, lease, mortgage or convey the property, with no obligation for notice to or authorization from the grantees. Vermont's Ladybird deeds transfer the property outside of the owner's will, without the need for probate. Even so, to avoid unnecessary complications, owners should make sure there are no conflicting bequests in their wills. Enhanced life estate deeds offer a flexible, convenient tool for a comprehensive estate plan, but they may not be appropriate in all cases. Contact an attorney with specific questions or for complex situations.